Welcome to our new monthly Advisory newsletter. I hope you will enjoy the new format and find everything you need to know about what is going on in the business. During the month of October I continued to visit our offices across Australia (heading to NZ next month). Des Silberberg and I have been sharing a message with all of our partners, directors and senior managers about operational excellence in Advisory including ensuring we are focussed on the right accounts, the right opportunities, pricing jobs fully and delivering as efficiently and effectively as we can. I hope these messages will flow through to all of our team members. Des and I would welcome any observations around how we work together to continue to deliver well for our clients and our business at the same time. The sweet spot in the middle for us is success for our clients, our people and the EY business more broadly. I also spent some time in Singapore last month learning about the new digital solutions and the campaign that has started here in Oceania to educate both ourselves and our clients on our capability. These solutions are real and we are already winning and delivering against them. 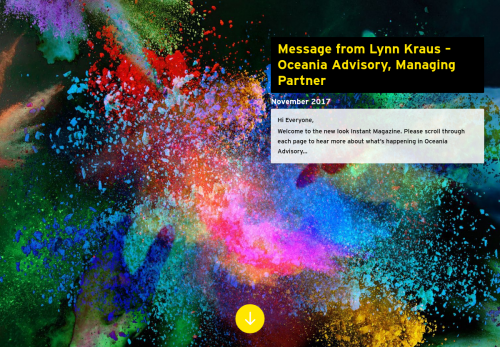 You can find out more in this newsletter by clicking through to Growth Drivers or by logging onto EY Discover – our online tool for sharing all of our IP. Last month was also an opportunity to celebrate promotions. I attended the New Manager programme in Brisbane and had the opportunity to spend time with over 100 new managers from our broader Advisory family (including FSO, PAS and the AAC as well as the Core). Also I travelled to KL and met our new senior managers and our next gen participants. It was great to spend time talking about the future of our business and the important role that these future leaders will play. From the discussions I had our future is bright! As you are no doubt aware, the result of the marriage equality survey will be announced November 15 and I would like to thank everyone for their support in raising awareness about the importance of fairness, equality and diversity. No matter the outcome, I hope we all continue to embrace the wonderful diversity of our culture. If you need support during this time please remember you can access our Assure Programs for a confidential conversation. Finally as many of you would have now seen Paul Clark has been named as the new Global Managed Services Leader and will be leaving Australia in the next few months. Paul has made a tremendous contribution to Advisory’s growth across APAC. He will be greatly missed and we wish him every success in his new role. As Paul leaves us, we welcome Iain Burnett to the role of APAC Advisory Leader. Iain has led the APAC risk practice now for a number of years as well as being the GCSP for Rio Tinto. Iain lives in Perth and is an Oceania partner. We are delighted about his appointment and look forward to working with Iain to continue to grow our business.